Bengaluru, Feb 13 (IANS) Protests by BJP legislators on Wednesday against an attack by JD-S workers on the house of one of its MLAs in Hassan forced Assembly Speaker K.R. Ramesh Kumar to adjourn the House. Bharatiya Janata Party (BJP) legislator from Hassan Preetham Gowda claimed Janata Dal-Secular (JD-S) workers pelted stones at his residence in Hassan earlier in the day. BJP legislators walked towards the Chair and raised slogans against the government alleging the law and order in the state had "collapsed". The party's state unit chief B.S. Yeddyurappa alleged that the ruling coalition partners were trying to "attack opposition leaders". "Attempts are being made by the ruling party to intimidate the opposition leaders," he told the media. The party has also been creating ruckus in the House demanding a judicial probe into an audio tape in which the Speaker's name figured in an alleged conversation between Yeddyurappa and JD-S legislator Naganagouda Kandakur's son Sharanagouda on February 7. The audio tape issue has rocked the Assembly for the past two days, after the Speaker asked the government to direct an SIT probe into it while the BJP demanded a judicial inquiry. On the Speaker's directive, Chief Minister H.D. Kumaraswamy on Monday ordered a SIT probe into the audio tape he released on February 8 to expose Yeddyurappa's alleged attempt to lure Kandakur join the BJP. The Speaker also wanted the inquiry report in the next 15 days. The BJP, on the other hand, has been asserting that Yeddyurappa's voice in the audio tape was "doctored" and a SIT probe would lead to a witch-hunt on its members. Amid the protests by the BJP in the House, the Karnataka Budget presented by Kumaraswamy on February 8 is yet to be discussed. 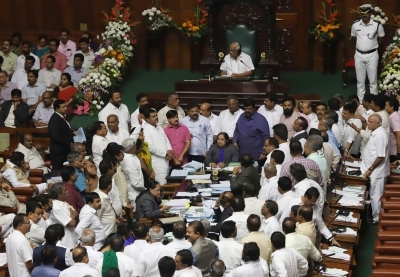 Anti-government protests by the BJP have marred the Budget session, which began on February 6, when a joint address by Governor Vajubhai Vala had to be cut short due to ruckus by the party against the ruling coalition.